I’m pleased to let you know that after a successful trial in semester two, 2016/17, the Library has now purchased access to four more collections from ProQuest’s Digital National Security Archive (DNSA). You can access these collections and the other 7 collections we already own from DNSA from the Databases A-Z list or subject databases lists. 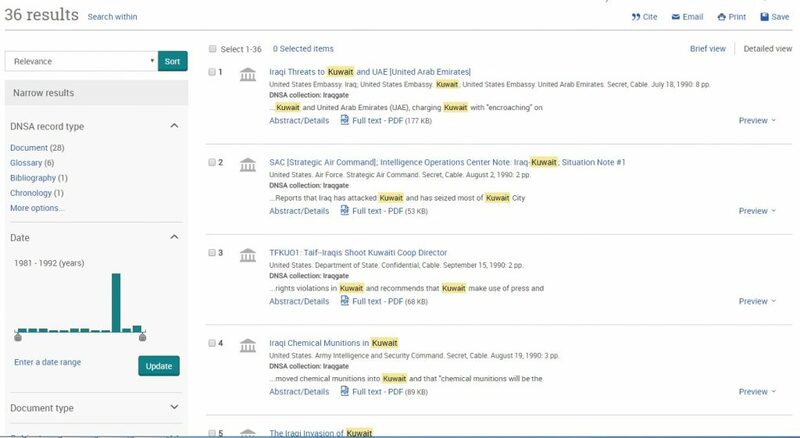 See Spotlight on Digital National Security Archive (DNSA) for information about the 7 previously purchased collections. Chile and the United States: U.S. Policy toward Democracy, Dictatorship, and Human Rights, 1970-1990. 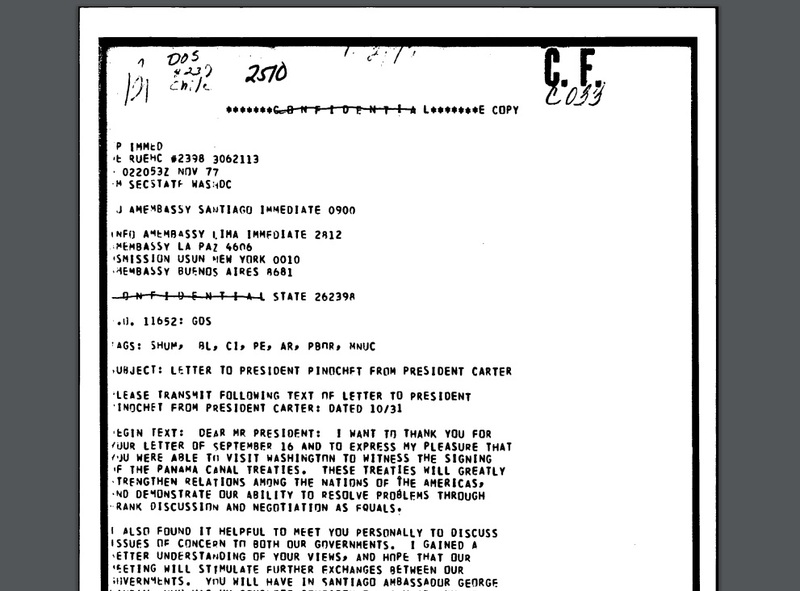 Screenshot of Letter to President Pinochet from President Carter United States. Department of State. Confidential, Cable. November 02, 1977: 3pp. This is a collection of 2,842 declassified records documenting the controversial history of U.S. policy toward, and relations with, Chile from 1970 when the Nixon administration decided to intervene against the Socialist government of Salvador Allende, to 1990 when the U.S.-supported military regime that deposed Allende was finally forced to step down. The collection covers a range of major issues, including the Nixon administration’s policy-making process related to overthrowing Allende, the implementation of covert operations to bring about regime change, as well as its assistance in consolidating the military government led by General Augusto Pinochet. The set also contains documentation on U.S. policy toward human rights violations; international terrorism; the historic, and peaceful return to democracy in Chile; and the pursuit of justice against Pinochet. The documents in this collection cover this dramatic evolution of U.S. foreign policy with respect to democracy, dictatorship, and human rights. A collection of leaked and declassified records documenting U.S. and allied electronic surveillance policies, relationships, and activities. It serves as an addition to several National Security Archive documents sets – including those on U.S. Intelligence and the National Security Agency. The records provide information on the limitations imposed on electronic surveillance activities, organizations, legal authorities, collection activities, and liaison relationships. While the large majority of records are from the post 9-11 era, also included are documents concerning the surveillance controversies of the 1970s – the SHAMROCK and MINARET programs – as well as from the 1980s and 1990s concerning United States Signals Intelligence Directive 18, which was NSA’s guidance concerning the collection, retention, and dissemination of information concerning U.S. persons. This collection provides a contemporary record of the political, military and paramilitary operations — overt, covert and extra-official — which served as the foundation for the most significant American scandal since Watergate. The collection consists of 4,635 documents totaling approximately 14,000 pages. The bulk of the documentation was produced between the fall of 1983, when Congress first put significant limits on official U.S. assistance to the Nicaraguan Contras, and the end of 1986, when the Iran initiative and the Contra resupply operations were publicly exposed, and official investigations began. Relevant legal papers, including the March 1988 indictment of National Security Council (NSC) officials John Poindexter and Lt. Col. Oliver North, and private operators Richard Secord and Albert Hakim, round out the set. The collection provides documents germane to the immediate scandal as well as to the decisionmaking process, the policies, and operations from which the Iran-Contra Affair evolved. This collection focuses on two major issues central to the Iraqgate affair. The first is U.S. policy toward Iraq during the 1980s up to the latter’s invasion of Kuwait on August 2, 1990. The second is the Banca Nazionale del Lavoro (BNL) affair, which came to the attention of the authorities and the public during the summer of 1989, following the revelation that the small Atlanta branch office of an Italian bank had provided Iraq with several billion dollars in off-book loans and credits. The majority of the documents in the set, therefore, date from the administrations of Ronald Reagan (1981-1989) and George Bush (1989-1993). During Reagan’s tenure in office, the U.S. Intensified efforts to improve U.S.-Iraq relations, in part to ensure against Iraq’s defeat in the Iran-Iraq war. This policy was continued after the end of the war, through most of the first year and a half of the Bush administration, until developing events, including the crisis brought about by Iraq’s invasion of Kuwait, rendered it untenable. The documents in this collection can be roughly divided into three major categories. Of these, the largest consists of materials created by U.S. government agencies. The collection also contains several hundred documents from the United Kingdom concerned with British export policy toward Iran and Iraq during and after the Iran-Iraq war. The third major category consists of documents specifically describing BNL-Atlanta and its transactions with Iraq. You can access these collections and the other 7 collections we already own from DNSA from the Databases A-Z list or subject databases lists. See Spotlight on Digital National Security Archive (DNSA) for information about the 7 previously purchased collections. Access to DNSA collections are only available to current students and members of staff at the University of Edinburgh. This entry was posted in Library, New, Online resource, Primary sources and tagged 20th century, Databases, History, International Relations, Politics, primary source, United States by cstirling. Bookmark the permalink.